Our modern four-wheel-drive vehicles, virtually without exception, are far, far better machines than those we traveled with 30 or 40 years ago, the rose-tinted recollections of some of us nothwithstanding. (See here for a direct comparison.) Yes, they are vastly more complex: The average car today has between 25 and 50 electronic control units or ECUs (the Bentley Bentayga has 90)—some linked, some independent—controlling everything from shock absorber adjustment to accident-avoidance braking. But those complex systems have brought us more power, better fuel economy, a huge improvement in safety, and cleaner air—all at once. Despite this complexity, vehicles in general are more reliable than ever. Solid-state ECUs are incredibly stable and durable; precision design and manufacturing processes and advances in metallurgy have made engines and other drivetrain components much longer-lasting. A car with 100,000 miles on the odometer used to be noteworthy; these days, beater pizza-delivery Civics with 200,000-plus under their faded paint are as common as Domino’s outlets. When something does go wrong, the car will quite likely be able to tell the mechanic what is is. How long will it be before a car can sense a part about to fail, then automatically log onto Amazon and have the piece waiting at the shop when the self-drive function reroutes you there? While tires and batteries have also been improved significantly in the last few decades, both are wear items and are subject to the whims of chance, whether it be a jagged root holing a tire or any number of things draining a battery. What this means, however, is that with just two kits in your vehicle you can fix the vast majority of things that are likely to go wrong in the backcountry. Let’s, er, start with the battery. A lot of people now have dual-battery systems in their overlanding vehicles, so the auxiliary can be used to power fridges, etc. without draining the starting battery. Most of these systems have a switch that will tie in the auxiliary to the starting circuit when needed, thus solving the problem of a dead main battery in a few seconds. If there is no switch, the auxiliary can be physically swapped with the main battery. Since the chances of two batteries dying simultaneously—at least when installed with a proper isolating system—are scant, you’re more or less immune to battery woes. If you have only a single battery for all your systems, I have just one word for you: Microstart. These have been around for several years now and I’ve been preaching their gospel to the point of fanaticism, but I still run into people who have never heard of the product and are blown away when I jump-start their dead 3/4-ton pickup with a battery the size of a VHS tape. I have used and abused a half-dozen of them (we keep one in every vehicle) and they’ve performed perfectly. Early on in their history, master fabricator Tim Scully and I wondered if they could be used for field welding. We duly hooked up three in series and produced several excellent beads, after which the trio continued to work perfectly for their intended use. When I called Scott Schafer at Antigravity Batteries he expressed mingled astonishment and horror at what we had accomplished. (Current Microstarts include an overload device that prevents such shenanigans. Blame Tim and me.) In any case, a Microstart will that ensure a dead starting battery will not leave you stranded. Buy the XP-1 if you have a gasoline-engined mid-size SUV, or the XP-10 if you have a big diesel-powered truck, and top it up (on either AC or DC) every four or five months. The only real alternative to safeguard a single battery is a low-voltage cutout, which will shut off current flowing from the battery if it senses voltage dropping to levels that would make the vehicle difficult to start. While this might be fine as a backup, I've found that a lot of people who install them are overburdening their battery to begin with, for example by running a fridge while still relying on the battery to turn a high-amperage starter. Better to go with a dual-battery system if you have that much draw. That leaves tires. As with batteries, they’re a lot tougher and longer-wearing than in years past, but still vulnerable to damage, especially when driven on rough roads and trails. Yet I’m surprised at how many overlanders confine their backup tire kit to a single spare and perhaps a can of Fix-a-Flat. We can do better, and all it takes is a compressor and a proper tire-repair kit. The repair kit is easy. At its most basic you want a plug kit, which will handle the majority of punctures within the tread area, usually without even needed to remove the wheel and tire from the car. But skip the Pep Boys versions and get a good one. This isn’t just tool snobbery talking: plugging a tire involves shoving pretty hard on the reaming tool and the plug-inserting tool. You do not want a cheap plastic-handled tool breaking during the procedure. ARB makes an excellent plug kit with everything you need for most simple punctures. If you want to step up from that and be prepared to handle virtually any tire problem short of a carcass-shredding blowout (including sidewall splits and broken valve stems), get the Exptreme Outback Ultimate Puncture Repair Kit. It’s expensive at $99, but you’ll never have to buy anything else to repair tires as long as you live. The ARB Speedy Seal kit includes a proper metal-handled reamer and plug inserter. Once the tire is repaired you’ll need to re-inflate it. While there are air compressors available from $19.95 on up, skip the cheap ones. They fail with miserable frequency, and even when working are so slow that you could hike out, buy a better unit, and be back before your tire is properly inflated. At a bare minimum get one of the ubiquitous Super Flow MV50 units, which are available from around $60. The MV50s have their issues but in general are reliable and reasonably fast, and if you’re a tinkerer there are dozens of web articles detailing worthwhile hacks for the product. Personally I prefer buying a better compressor to start with, both for repairing tires and for the much more frequently needed function of airing all four tires back up after airing them down for trail driving. To step up in quality look at the Viair units and anything from Extreme Outback. My current favorite compressor is the blindingly fast ARB Twin, expensive but worth every penny. Use the Twin to air up and you’ll be finished with your own vehicle and a friend’s before someone with an MV50 has done two tires. The ARB Twin is available either as the portable kit shown here,which includes an air tank for operating air tools, or as a stand-alone unit for hard mounting in the vehicle. 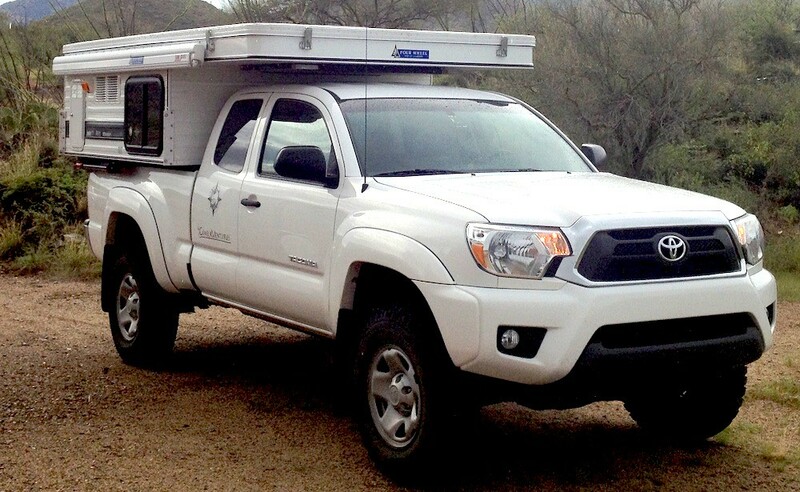 Part of what defines overlanding is self-sufficiency. Making sure battery and tire troubles can’t bring you to a halt will go a long way toward guaranteeing that self-sufficiency—and if you travel far off the beaten track might just save you a sat-phone call and a very expensive recovery.